Mixing is the heart of rubber industry where the rubber technology is the main component of the production process. The moulding process is done in a dust free environment with each moulding size upto 1000 mm. The transfer moulding for production is done with highly sophisticated automatic compression moulding machines. Extruding of the semi-finished products is done with the help of cold feed and hot feed extruders. With independent controlling factors, a precise profile can be extruded with close tolerance. Our manufacturing facility works in coordination with CAD/CAM facility which is managed by team of design engineers. It enables us to develop the required mould in - house within close tolerances and on time. 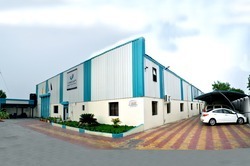 We Viscon Rubber industries equipped and well designed State - of - the - art Manufacturing Facility which assists in manufacturing rubber moulded products , Gaskets , Rubber hoses, Rubber Extruded products . There are 2 capacious manufacturing units; each of each stretched over 12000 square feet. 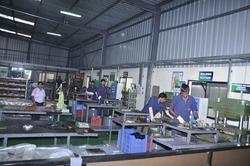 With the support of spacious production facility, we can develop 1500 units in one installment. The units are operated under the supervision of diligent teams. We have high tech tool room with machine like VMC, milling machine, surface grinder and various conventional machines, surface plate backed up with highly sophisticated measuring instruments which are calibrated regularly.